The state’s top tribunal is expected to issue ruling soon in lawsuit filed against Explorer editor after he canoed through private property. A lawsuit sparked by a canoeist’s paddling through private land in 2009 may finally be nearing an end, as New York’s highest court heard arguments in March on whether the waterway in question should be open to the public. After the arguments, Explorer Editor Phil Brown talks with an Associated Press reporter. The Friends of Thayer Lake and the Brandreth Park Association sued Adirondack Explorer Editor Phil Brown following a trip that began at Little Tupper Lake and ended at Lake Lila. In between, Brown paddled a two-mile stretch of water that traverses property owned by the plaintiffs. The Mud Pond Waterway, as it’s sometimes called, comprises Mud Pond, Mud Pond’s outlet, and part of Shingle Shanty Brook. The landowners, who had posted the waterway, sued for trespass after Brown wrote about the trip for the Explorer. The state Department of Environmental Conservation subsequently joined the case, supporting Brown’s position that the public has a common-law right to paddle the waterway, which connects two pieces of the state-owned William C. Whitney Wilderness. The two sides disagree over what makes a waterway “navigable-in-fact”—a legal term applied to inland waterways that are navigable and open to the public. 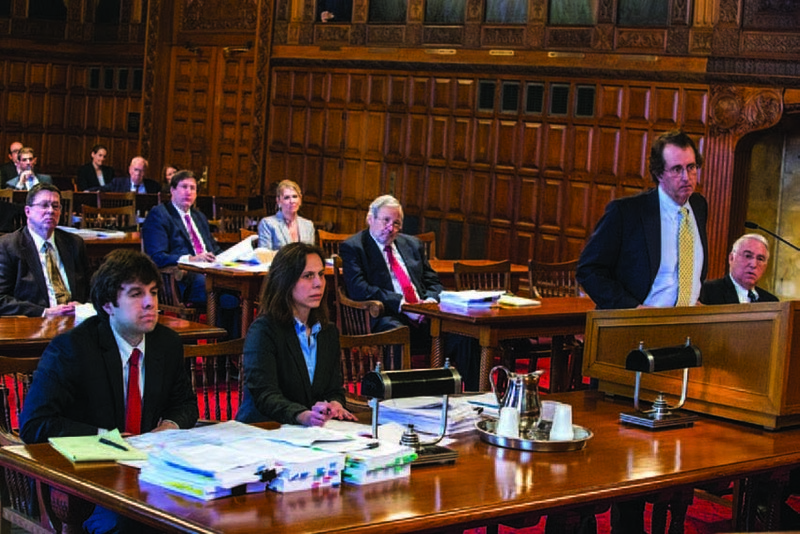 In oral arguments on March 24, the Court of Appeals in Albany allotted each side twelve minutes, with attorneys for Brown and the state splitting their time equally. All three attorneys spent much of their time answering questions from the seven judges, who are expected to hand down a ruling this spring or early summer. Dennis Phillips, who represents the property owners, told the court that a waterway must be useful for commercial transportation to qualify as navigable-in-fact. He contends that the Mud Pond Waterway is too narrow, shallow, and remote to serve a commercial purpose, such as floating logs or transporting goods to market. At the end of his arguments, Phillips likened Brown’s canoe trip to Hitler’s invasion of Poland in 1939 as driven by “want” rather than “need.” Throughout the litigation, Phillips has stressed that Brown could have avoided paddling through private property by carrying his canoe along a portage trail on state land. Caffry argued that Phillips’s view of the common law is too narrow. In 1998, he said, the Court of Appeals ruled that recreation, not just commerce, can be considered when determine whether a waterway is navigable-in-fact. In that case, the Adirondack League Club sued five paddlers who traveled through the club’s property on the South Branch of the Moose River. The current case is largely a dispute over what the court meant in the Moose River case. Phil Brown’s attorney, John Caffry, at lectern, takes a question from the Court of Appeals. Also shown are, left to right, Brian Ginsberg, representing the state; Claudia Braymer, an attorney in Caffry’s firm; and Dennis Phillips, representing the landowners. Associate Judge Eugene F. Pigott seemed skeptical of Ginsberg’s argument. “If somebody wants to go up and down in their canoe for recreational purposes, that probably shouldn’t be within the definition [of navigable-in-fact], but if you put fifty canoes together and you charge them, now we’ve got commercial, and now you’ve got the right to do it?” Pigott said. Caffry and Ginsberg also argued that the plaintiffs’ own use of the waterway to transport furs, building materials, and other goods is evidence of its capacity for commercial use. Caffry and Ginsberg rebutted suggestions from judges that opening the waterway to paddling would open the door to other uses by the public, such as snowmobiling in winter or camping on the private land. Both sides garnered extensive support from outside groups. The Adirondack Mountain Club and Environmental Advocates filed a legal brief backing Brown. The Adirondack Landowners Association, Empire State Forest Products Association, New York Farm Bureau, Property Rights Foundation of America, and Pacific Legal Foundation supported the landowners. 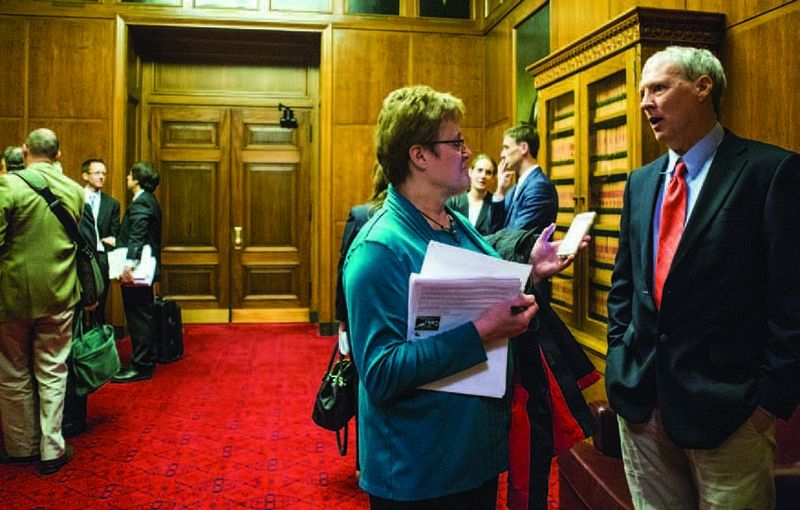 Phillips said the case has drawn national attention from property-rights advocates who are concerned that a ruling against the Brandreths would destabilize property rights. Although a decision from the Court of Appeals would be binding only in New York State, it might be influential in other states.